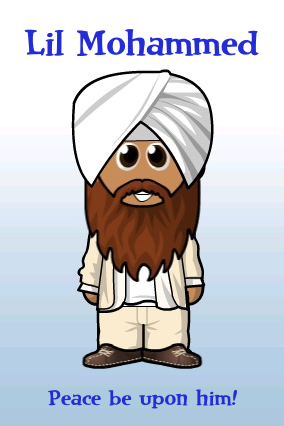 This is my drawing of Mohammad. I wish I were a better artist, and could draw something other than a stick figure. But I actually kind of like its purity. If a simple, entirely undistinguished, smiling stick figure with the word "Mohammad" above it can be so offensive as to earn me a possible death sentence... that makes the whole silly idea seem even sillier. And I like the fact that it's a photo of my hand actually making the drawing. Gives it a certain punch, I think. Today is Everybody Draw Mohammad Day: an event in which people around the world... well, draw Mohammad. We're deliberately violating the Muslim law against creating images of the prophet Mohammad -- a law that some radical Muslim extremists are attempting to enforce with violence and death threats. On everyone. Muslims and non-Muslims alike. Actually, strike that. It is a law that some radical Muslim extremists are successfully enforcing with violence and death threats. Everybody Draw Mohammad Day was instigated by Seattle cartoonist Molly Norris, after Comedy Central cut a portion of a South Park episode following a death threat from a radical Muslim group. And this is hardly an isolated incident: when the Danish newspaper Jyllands-Posten ran the cartoons of Mohammad that sparked violent protests around the world, many news publications declined to publish the cartoons in question, despite their obvious newsworthiness. Many newspapers still won't publish them. And when this self-censorship happens, the Muslim law against drawing Mohammad has successfully been enforced. Today, along with hundreds of people (hopefully more), I'm drawing Mohammad. I don't normally go out of my way to offend people's religious sensibilities. I'm perfectly willing to do so, obviously: most of what I write here offends somebody's religious sensibilities, and of course I know that most of my atheist writing is deeply offensive to many religious believers, simply because it is atheist. But offending people's religious sensibilities, while it's something I'm willing to do, is secondary. It's a side effect of the fact that I'm making some point. It's rarely the point itself. I rarely offend people's religious sensibilities just for the sake of it, simply because people find it offensive. That's more or less what I'm doing today. I realize that. I'm doing it because, in some cases, offending people's sensibilities is, in and of itself, a valid point. And this is one of those instances. The idea that the rules of a religion ought to apply to people who don't follow that religion? It's flatly absurd. As Hemant Mehta of Friendly Atheist so brilliantly pointed out, "You never hear about Hindus walking into McDonald's and telling the manager they're not allowed to use beef products anymore. If they did, we would laugh it off. We'd say that's absurd because non-Hindus don't have to follow their rules." But that's exactly what these radical Muslim extremists are doing. Despite the fact that they will happily violate the Hindu rule against eating beef, or the Orthodox Jewish rule against interfaith marriage, or the Yazidi rule against wearing the color blue, they nevertheless feel that it is their right, and indeed their duty, to enforce the Muslim rule against drawing Mohammad -- even on people who aren't Muslim. Using violence, and threats of death. And it is not possible to effectively protest this by simply saying, "This is wrong." The only way to effectively protest this is by violating the damn rule. If we all wring our hands and say, "Oh, yes, this is terrible, how dare these terrorists use violence and death threats to enforce their religious rules on people who don't share them" -- and still nobody will break the damn rule because we're afraid they'll hurt or kill us -- then their terror tactics will have worked. I'm drawing Mohammad to send a message to Muslim extremists -- and other religious extremists -- that their terror tactics will not work. I'm drawing Mohammad to reject out of hand the attempt to make criticism of Islam -- or of any other religion, for that matter -- off-limits, simply out of fear of violence. I'm drawing Mohammad because many people feel comfortable critiquing, or poking fun of, or indeed commenting on, any other religion... but avoid doing any of this with Islam, for fear of violent retribution. And I refuse to allow myself to be extorted in that way. And, perhaps most importantly of all, I'm drawing Mohammad to spread the target around... so there are so many people drawing Mohammad, the terrorists can't possibly go after all of us. This is a point made by Ayaan Hirsi-Ali -- former Muslim, current atheist, target of a fatwa for her outspoken blasphemous criticism and defiance of Islam. In a piece she wrote about the South Park/ Comedy Central incident -- and about the seriousness of the death threats against the show's creators -- she asked, "So what can be done to help Mr. Parker and Mr. Stone?" And she answered, in part, "Do stories of Muhammad where his image is shown as much as possible. These stories do not have to be negative or insulting, they just need to spread the risk. The aim is to confront hypersensitive Muslims with more targets than they can possibly contend with." And there is no way to make that point without actually violating this rule. Perhaps you think that going out of your way to offend a cherished tenet of people's religious beliefs is... well, offensive. Hurtful. Perhaps you think that secular groups and others organizing "Draw Mohammad" protests are engaging in anti-Muslim or anti-Arab marginalization. Perhaps you think that deliberately breaking another religion's sacred rule, with the sole and stated purpose of breaking that rule, is a form of religious bigotry. Or even just childish jerkitude. A lot of people think that: moderate Muslims, and others. To them, I say... well, Claudia commenting at Friendly Atheist said it way better than I could, and I'm just going to quote her: "The day drawing a bloody stick figure isn't something you have to do while looking over your shoulder. The day cartoonists don't have to build panic rooms in their homes (!!) for a rough picture of a dog with a mans head. The day dozens of people don't die (again !!) because of some cartoons. On that day, I will agree that the secular group is just being immature and hurtful." Is it hurtful to deliberately poke people's sore spots with a stick, just for the sake of doing it? Yes. I don't think it's a very nice thing to do, and I don't generally do it. But is it far, far more hurtful -- not only to certain individuals, but to every individual in the world, and to society as a whole -- to use violence and death threats to frighten people away from criticizing your religion, and to force obedience to your religious views on the entire human race? By a thousand orders of magnitude, yes. And in this case, the only way to oppose the latter is to engage in the former. There's something I want to say here: words that keep brimming up in my head and won't shut up. I'm reluctant to write them down; I cringe a bit at the thought of posting them; they've become such a cliche that it's embarrassing to even think them. I never imagined that I'd say these words as anything other than a joke. I never imagined I would say them with any sort of sincerity or passion. But if we don't draw Mohammad, the terrorists win. I disagree with your last sentence, simply because terrorists, by their very psychology alone, don't need a drawing as an excuse. They will use any excuse. I don't approve of fundamentalist Islam, particularly the way it marginalizes women and every single technology that is beneficial to society, but I don't think drawing Mohammed is going to alter the horrifying situations facing women, let's say, in Afghanistan, they're just going to make a bunch of fundamentalists angry. I currently live in a country that does, like many countries, have a Muslim population. Not all of them are extremist. Sure, the extremists, that are offended with everything, of course don't want to relocate, they like the social security benefits, but still feel they have to comment on our morals and so on, but they're the minority, and a picture isn't going to change their attitude when governments -due to political correctness- cower. I don't think that anyone argued that drawing muhammad was going to alter the fate of women in Afghanistan. To the above commenter, I ask, if we can't influence whether or not WE are permitted to make a drawing without fear of violence, can you really presume we could influence whether or not THEY will change their attitudes and behaviors toward women? The problem of anachronistic belief systems and the values they perpetuate cannot be teased into distinct, neatly circumscribed issues. Not in my opinion. TB: I think you may be missing the point. The questions isn't whether our behavior is likely to change that of the Muslim extremists. The question is whether we're going to let their behavior change ours. I agree that the Muslim extremists are likely to keep doing whatever they're going to do, regardless of what we do. (Although our behavior and the world we create may affect their children, and how they see the world and decide to act in it.) But if we let ourselves be cowed into not commenting or critiquing or questioning them exactly as we would with any other group, simply because we're afraid of their threats, then they will have won. They will have successfully prevented comments and critiques and questions about their religion. And that is not acceptable. THIS is NOT the prophet Mohammed. I repeat: this is NOT Mohammed. The unfortunate flaw in, "spread the risk to more targets than they can hit", is that it only works if large numbers of people in their own countries start doing it. Otherwise, they just hate the ones they hate more, and have every intention, if they ever gain the means, to hit ***all at once***, like with a nuke. While I agree with the cause, sometimes one needs to look at the reality of what one is dealing with, and recognize that the limits *we* have on our behavior, or actions, are not the same as the enemy, and that we may be drastically underestimating what they can, and will, do, given the chance. That said, there is also no other obvious avenue to appose this particular idiocy, at this point, so the risks may be completely necessary. I am somewhat worried about this "event," but it's been difficult for me to articulate why. I agree with everything you've written. This is something that needs to be done. However, I think there's also a significant chance of retribution somewhere. Someone may very well die over this, and it might be a cute blonde co-ed from Main Street College, U.S.A. If it is, how will the media react? Will they condemn the Muslims or the nasty atheists who insisted on poking the Islamic Bear? (We already know that the media prefers to defer.) Will there be litigation against facebook if someone gets hurt? This is a potentially explosive situation, and I fear for the backlash if it ends badly for even one armchair cartoonist. I hadn't planned to participate, but you convinced me. I like your idea Andrew! Well...I cheated. I can't draw worth a damn so I altered a Peanuts picture and added a snotty, offensive caption. I don't usually set out deliberately to offend religious people, but I don't particularly care if I do happen to offend them. After all, what's good for the goose is good for the gander. They don't mind offending me when they say I deserve to suffer in hell forever just because I don't share their fantasies. They don't mind offending me when they say that I should be killed for drawing a picture. They don't mind offending me when they want to distort school curricula to conform to their ridiculous myths. They don't mind offending me when they want free speech rights to apply to them but not to me simply because they don't like what I say. Given all that, I'm not going to apologize for the fact that I don't give a damn whether anyone is offended by our drawings. We've got a Constitutional right to speak, and draw, our minds; the best way to preserve that right is to exercise it. I understand the importance of this as both a gesture and a tactic in combating intimidation. However, I don't quite accept that this is analogous to violating rules in other religions one is not a member of (by eating beef, marrying outside of one's faith, etc.) Because unlike those examples, this isn't a case of just living your life in what you see as a morally acceptable way and having to contend with zealots; there is really no reason whatsoever to depict Mohammed other than to offend. Frankly, if there weren't this widespread tactical action being taken right now, it's hard to see what reason one would ever have to draw Mohammed other than to be a jerk. That said, I don't necessarily disapprove. I agree unequivocally that no one should have to live in fear of violence or even the threat of it because of their expression. My stick figure has a beard. Yay! Thanks for posting this. I'm fairly new to blogging and still have to figure out how to include images, so I settled for writing a post in support and linking to posts (including yours) which I like. You and the Friendly Atheist inspired me to participate. Accusations that this is all just hate speech are baseless. Let's not forget that over a hundred people died in 2005 because someone depicted Mohammed in a satirical cartoon. And Western media did in fact choose to censor itself and trade in on our most fundamental values out of fear of violence retaliation. And now millions of citizens of Pakistan are having their freedoms trampled on to accommodate the violent fanatics as well. This is squarely an issue of defending free speech against those who threaten violence and murder against those who don't play by their rules. And many are indeed willing to make good on those threats. Demanding respect with a sword brings not unity but tyranny. Some pictures at my school, UNC-CH, featuring Muhammed and his 6-year-old bride, Aisha, who, it is said, was deflowered by the prophet at age 9. Whoever drew these was not willing to allow freedom of expression to be sacrificed at the altar of religious extremism. After all, it's a free country, right? Ms. Anthropy: Yes, you have my permission to print this image on a T-shirt. If you sell any, I want a cut; if you're just making one for you (or a few for you and your friends), go for it. And thanks for asking! Ms. Christina - you know where I stand. You go on and draw Mohammed any way you chose. This is America and I've seen Jesus portrayed in very very humiliating ways in pornographic literature. You don't see us threatening your life for it - we don't like it, but - again, this is America. I spent 20 years defending your right to think as you wish. I may not agree with your choices, but I swore to defend your right to make that choice.